This is a story about a five year old boy who lived for ten days in a badger hole. It is a story that has been told for over eighty years and is by now almost a Manitoba legend. The story was told for the first time in the Manitoba Free Press of July 19, 1873. It was told again in 1953 just about the time a little Winnipeg girl was missing near Kenora. Between 1873 and 1953 it has been recalled on a number of occasions. In 1881 Jeff Gee in his book A Sketch of Both Sides of Manitoba reprinted Peter Fidler's account of the incident. Fidler's story of how he found the missing boy in a badger hole was told in the Winnipeg newspaper soon after the boy was returned safely to his parents. Jeff Gee, whose real name was J. F. Galbraith, had taken part, while working for the paper, in the search for the boy. In 1908, Ernest Thompson Seton, naturalist to the Government of Manitoba, published a two volume study called Life History of Northern Animals. He tells of many strange friendships which animals form but the most remarkable of all, he thought, was the friendship of the badger with a lost boy. Seton was told the story by George Fraser and his mother of Kildonan and by Archbishop Matheson who no doubt had told the story many times to his friends for he had been a student minister in the district at the time the boy was lost. Finally the story was told in the Country Guide in 1951 by Margaret Arnett MacLeod one of our most respected students of Manitoba history. Mrs. MacLeod's story won an award in the 1950-51 literary competition conducted by the Toronto Women's Canadian Club. Here then is the story of Billy Service who lived and played with badgers for ten days. One day in July, 1873 Billy left his home to pick strawberries. When it grew dark and he did not return, his parents and friends near Springfield, Manitoba were worried and set out to look for him. A few days later, a large number of people from Kildonan and Winnipeg joined in the search. When the loss of the boy became generally known throughout Winnipeg, further attempts to organize search parties were made and an application was made to Lt. Col. Osborne Smith for assistance from the army. Soldiers, however, were not available. One large search party which went out from Winnipeg included the entire staff of the Manitoba Free Press. Still Billy couldn't be found and there seemed little chance he could survive without food, water, or shelter. Finally, Billy's father offered a reward of $200 for the recovery of his son. Ten days after he had strayed from his home, Billy Service was found eight miles away in a badger hole by Peter Fidler who was out hunting. When Archbishop Matheson told the story of Billy Service in 1936, he stated that Mrs. Fidler was said to have had a dream in which it was revealed to her that the boy could be found in a badger hole and that she induced her husband to go out and look for him. When he was found, Billy's clothes were torn, his face scratched, and his mouth and tongue were black with mud and swollen. He had lived on strawberries, grasshoppers, and mud. While he had been wandering around lost, Billy had come across a mound in which there was an unusually large badger hole. It was large because it had been used by a wolf before the family of badgers moved in. The badgers did not use the large entrance made by the wolf but a smaller tunnel on the opposite side of the mound. When it started to rain, Billy ran to the only shelter he could find  the badger hole. He crawled in. At least there he was warm and dry. He found out though that he wasn't very welcome. The badgers scratched him and tore his clothes. The only thing Billy could do was slap them and scratch back until they stopped bothering him. When it stopped raining, Billy went outside to look for strawberries. While the older badgers were away looking for food, the young ones came out and started to play. Billy drew near and joined in their play. Soon they became friends and when the mother and father badger returned, they didn't seem to mind the new playmate their cubs had found. At night, Billy and the badger family went back into their home. The badgers didn't object to him now. Each day the older badgers brought him food when they fed their young. Sometimes he ate it. Sometimes he preferred strawberries, roots, and mud to the gophers and mice his animal friends brought him. One day while resting in the hole, Billy saw a man  with a gun. He was frightened and cried a little. The man came nearer. 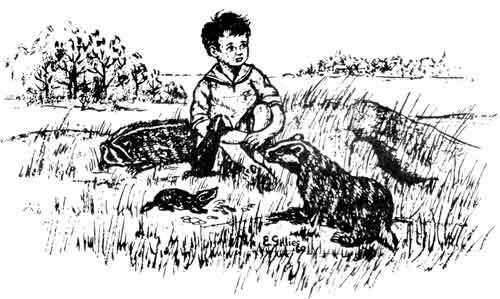 He had heard Billy cry and as he bent down to look in the badger hole he was surprised to see a small boy's hand. Billy didn't say anything. He was so frightened that Peter Fidler, the man who had found him, had to coax him out by promising him food. Billy began to cry again when he was taken away from his prairie playmates for they had become good friends but all his life he knew that he was the only boy in the world who had lived for ten days in a badger hole.